There is much still to do to secure agreement on this, but it’s time now to start to put meat on the bones and lay out which specific indicators should be on the table as part of such a framework. I think it’s critical that inequality within countries is part of that debate, at least with respect to assessing the respective capabilities of different countries. Greenhouse Development Rights is the best-known framework that attempts to do that, but as we approach 2015 we need more dialogue on the relative merits of this and other approaches to doing so. It’s worth reminding ourselves – even avid GDRs-fans – of the ethical case for taking account of intra-national inequities in determining international fair shares, not least because some, like Benito Muller and Lavan Mahadeva, seem to disagree. One starting point is that if equity is to mean anything, it should refer ultimately to equity between people and not only between governments or countries. As Muller and Mahadeva suggest, this could be justified on the Aristotelian principle that like cases should be treated alike – ie people should be treated the same whichever country they happen to reside in (which is for many a question of pure brute luck, and therefore not a sound basis on which to make moral distinctions). No doubt an argument for a people-centred or inter-personal vision of equity can also be advanced on human rights grounds. In this light, determining fair shares of the global climate action effort by reference simply to a country’s aggregate emissions and/or income seems unfair because it doesn’t take account of and may penalise the majority of citizens of countries with large and mostly very poor populations, like India. 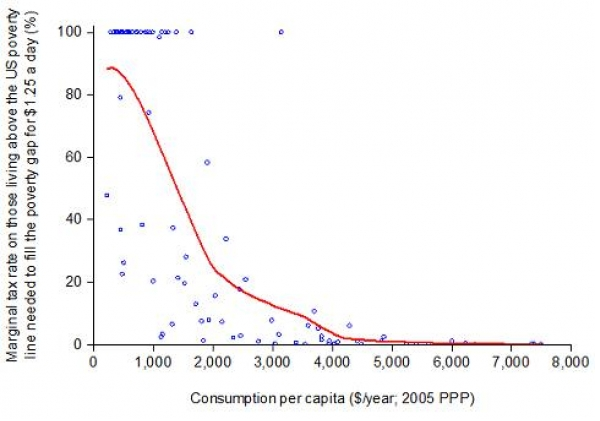 On the other hand, using per capita indicators is also flawed because it allows rich high emitting people in poor countries with large populations, like India, to free ride (the ‘hiding behind the poor’ problem). Instead, to be able to treat like people alike, we should take account of the distribution of emissions and/or capacity within a country in assessing that country’s fair share. The distribution of economic capacity in a country matters also because it is a major determinant of a country’s poverty level (see Andy Sumner’s work to get a sense of the extent of this). Since various texts of the Rio conventions recognise that the overriding priority of developing countries is poverty reduction, this means that intra-national inequality has a (potentially very large) bearing on the capacity of countries to tackle climate change. We need indicators of capability that can measure that. What makes the importance of intra-national distributions of capacity (and/or emissions) even more pressing is, as Sumner shows, the fact that now the majority of the world’s poorest people live not in low income countries, but in middle income or “emerging” countries with very high rates of inequality. Significantly for the climate equity debate, these are the same countries where emissions are high and rising – like the BASIC countries (Brazil, South Africa, India and China), around which the politics of equity in the 2015 deal are likely to revolve. To develop indicators that can measure their capacity to fight poverty and climate change, we need a better understanding of the extent of the poverty and inequality challenges such countries face. The graphs of Branco Milanovic certainly help to bring some perspective, by plotting the intra-national income distributions of different countries and showing where each percentile is placed within the global income distribution. The results shock many people. 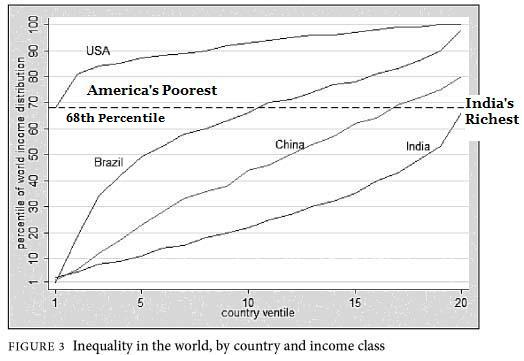 As the example below shows, only the top few per cent very richest people in India have incomes (PPP-adjusted) comparable to the poorest few per cent of people in the USA. Brazil, one of the most unequal countries on earth (though also one of the few G20 countries to at least be making some progress on inequality), is home simultaneously to the very richest and very poorest people on the planet – a microcosm of the entire global population within one nation-state. This trend in which the poorest citizens on our planet have become increasingly located in very unequal middle income countries (and whether this is set to continue or reverse) has generated significant debate in the development sector, not least in terms of what it means for how aid budgets should be allocated now and in the future. But what does it tell us about the capacity of such countries to cut GHG emissions and otherwise contribute to the fight against climate change? Let’s assume for a moment that there does exist a trade-off between using resources to fight poverty and to tackle GHG emissions, which some may challenge. No doubt there are “no regrets” or “co-benefits” measures which should be exploited (as suggested by D. Raghunandan in the paper below), but it’s certainly not clear these alone will cover the level of emissions cuts needed in “middle income” or “emerging” economies to drive the global reductions necessary to avoid catastrophic global warming. Many will argue however that middle income countries like the BASICs can afford to both fight poverty and to tackle climate change. There is a populist strand to this line of thought that suggests a country like India, which after all has a space programme and many very rich citizens, should be perfectly able to tackle its poverty problem and pay to slash its greenhouse gas emissions at the same time. The work of Martin Ravallion can be very useful in testing this assertion. Ravallion assesses the cost of closing the poverty gap in each developing country (ie the cost of lifting all of its population from below to above, either the $1.25 or $2 poverty lines), and then calculates what the marginal tax rate would have to be on the richest citizens in that country (defined at the same level of income as those asked to pay tax in the US) in order to close the gap. He terms this a country’s “defensible capacity for redistribution” to eliminate poverty. What could this mean for the debate on equity at the UNFCCC? I think it could mean that the “capacity for redistribution to end poverty” is a contender to be one of the “members of an envelope of approaches” that constitutes an Equity Reference Framework. Perhaps it could be an alternative to the GDRs capacity indicator (something I’d like to think more about). It should probably mean that countries which would require a marginal rate of tax of 100% or more to end poverty at home should at least be eligible for international mitigation financing, and perhaps those requiring a marginal rate of less than 10%, say, should not. But whatever the specific applications of such metrics, one thing I think the work of Sumner, Ravallion and others makes clear is that the extent of intra-national inequality, and the capacity of a country to close it, are key considerations in a country’s capacity to fight poverty, and are therefore highly relevant to the consideration of a country’s capability at the UNFCCC. This is contrary to Muller and Mahadeva who say they “felt [domestic income distribution or degrees of domestic inequity] are not relevant to capability”. Ultimately it’s for political reasons that I think we need to include considerations of intra-national inequity as part of the climate equity debate (and it’s that which got me thinking about this in the first place). Firstly, I think that taking account of intra-national inequity could help to move the international negotiations closer to consensus. I found the Milanovic graph very helpful in challenging the misleading reference by a former US chief negotiator last year to the “millions of people in India living middle-class lifestyles by US standards”. He said he found it “compelling”. Perhaps, as my former colleague David Waskow (who suggested the “fractals” analogy in the title) has suggested, civil society should be doing more to dispel such myths at the national level in rich countries to open political space for their negotiators at the UNFCCC. Oxfam and others have been trying to influence that debate from the perspective of development aid for some time, and there’s no question that in challenging lazy assumptions, data helps. Similarly, as D. Raghunandan explains in this excellent piece commissioned by my colleagues at Oxfam India (it’s behind a pay wall, but we’ll be publishing an extended version soon), if a country like India were to ground its strident positions on equity at the international level with clear reference to and recognition of the intra-national inequity within India, it would strengthen the Indian negotiating position tremendously. I’m also interested in how a clearer frame around inter-personal inequity could underpin support for climate finance-raising options that redistribute resources globally, from the richest in rich countries (eg via Financial Transaction Taxes, or progressive carbon taxes) to the poorest in developing countries (eg via pro-poor funding modalities in the Green Climate Fund) – though this needs more thought. But perhaps most important is the potential that looking at climate equity in terms of intra-national inequality can have to leverage more ambitious – and more progressive – climate action at the national level. After all, the ultimate test of any international equity framework must be not just whether it helps broker an agreement between governments, but the extent to which it helps to unlock greater low carbon action by those governments at home. In a recent discussion paper on low carbon development in South Africa, Liz McDaid and I argue that the fight against inequality and hunger should be at the heart of the politics of low carbon development in South Africa. Despite relatively ambitious international climate pledges, the government is running into delays in implementing a range of low carbon policies in the absence of broad-based domestic constituencies of support. It’s a problem with parallels from Mexico to the EU. To unblock progress, we argue that the low carbon agenda has to be one that serves, and is seen to serve, the interests of the majority of people on low incomes, as part of their everyday struggles for rights and greater equality. When electricity and food bills are rising, and people on low incomes are forced to choose between spending on food or electricity, low carbon policies – like the South African carbon tax – that are seen to raise costs further will struggle to make it to the statute books. One proposal we make is to turn the carbon tax into an explicit tool of economic redistribution, in order to win the broad-based support it needs. That’s not so different in the UK, where the Liberal Democrat Secretary of State for Climate and Energy Ed Davey has been floating the idea that communities near new wind farms will receive 20% cuts to their electricity bills. When low carbon options work for and not against people on low incomes, there’s a chance of building a new politics of action. As Monica Arroya, a former negotiator for Costa Rica, has also argued, it’s only by building a low carbon politics that speaks to the specific circumstances and identity of countries and regions that we will see progress made. And for most developing countries, especially the “middle income” countries that are at the core of this debate, that means linking low carbon policy to the struggle for greater economic equality. In conclusion, I think there are good reasons on ethical and instrumental grounds for putting intra-national inequality into the debate on climate equity, and some lessons from the development aid sector that could help us to operationalise that at the UNFCCC. Most importantly, I think we need a wider frame around inter-personal climate equity if we are to build progressive movements of people to press for climate action, especially amongst those who are marginalised or on low incomes. That means making climate equity less abstract, and more relevant to the daily struggles and motivations of people on the streets, not just in the halls of the UNFCCC.